Ode crams more joy, creativity, and satisfaction into a couple of hours than most games manage in ten times that long. This has become something of a habit for developer Ubisoft Reflections, whose previous games include the charming Grow Home, where you play as a smiley little robot climbing a giant plant, and its equally splendid sequel Grow Up, which expanded Grow Home's concept in a small but beautifully designed open world. Reflections has ground out a niche for itself specialising in short, optimistically minded games that nevertheless surprise with their mechanical ingenuity and satisfying interactions. 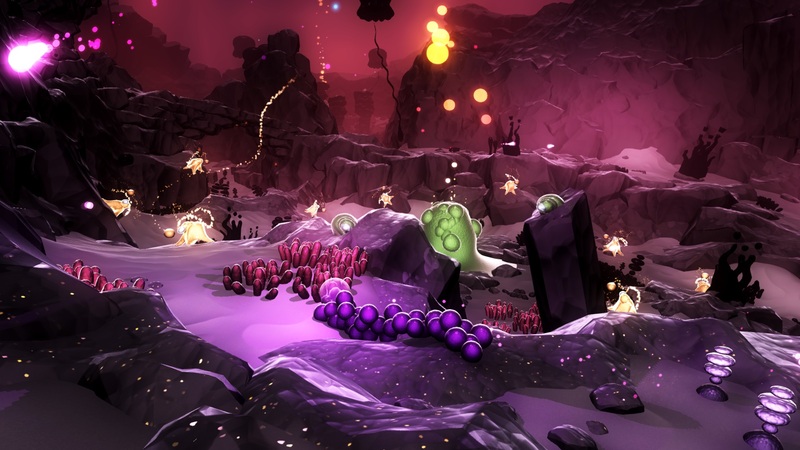 In this way, Ode is just like Grow Home. But at the same time it's a very different game. It's a kind of musical platformer, a harmonious marriage between the rhythmic walkabouts of Ed Key's Proteus and the colourful imagination of the 3D Mario games. That's a lengthy way of saying that it's absolutely bloody delightful. You play as a cute little blue fellow trapped inside what looks like an isolation ball for children with highly contagious diseases. The only affliction our character is likely to suffer from is an excess of happiness as he rolls freely around a series of beautiful alien landscapes. It's basically a cheerful Zorbing simulator, only without the risk of vomiting all over yourself or sustaining a horrific, life-changing injury. There's no instruction given to the player regarding what they're supposed to do. Instead, Ode lets you figure it out as you play. It won't take you long to decipher what's going on, not least because I'm about to explain it to you anyway. 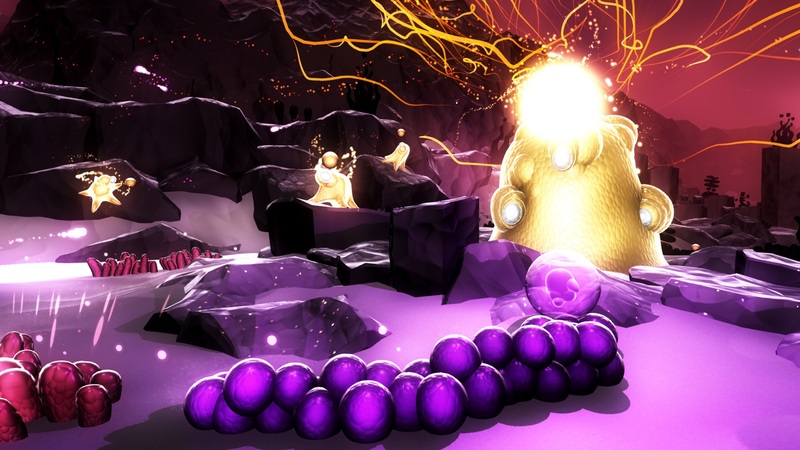 As you roll your ball into one of the many strange looking plants you encounter, it'll emit a sound. Hit several of the same plant in succession, and you'll get the beginnings of a beat or a melody. As you're doing this, you'll probably stumble over one or two seed-like golden spheres, which will start following you around when you touch them. Naturally you'll start to search for more golden seeds. Within about 10 minutes, you'll come across what appears to be a mountain of green jelly, surrounded by several smaller-looking jellies that for some reason remind me of tardigrades (microscopic creatures that are basically indestructible). If you touch one of these tardigrades while being followed by a seed, the seed will conjoin with the tardigrade and illuminate it. Do this with all the surrounding tardigrades, and the giant jelly will burst with light, triggering a new layer of music that weaves itself into the current tune. Describing Ode in this way makes it sound like nonsense. But that's kind of the point. 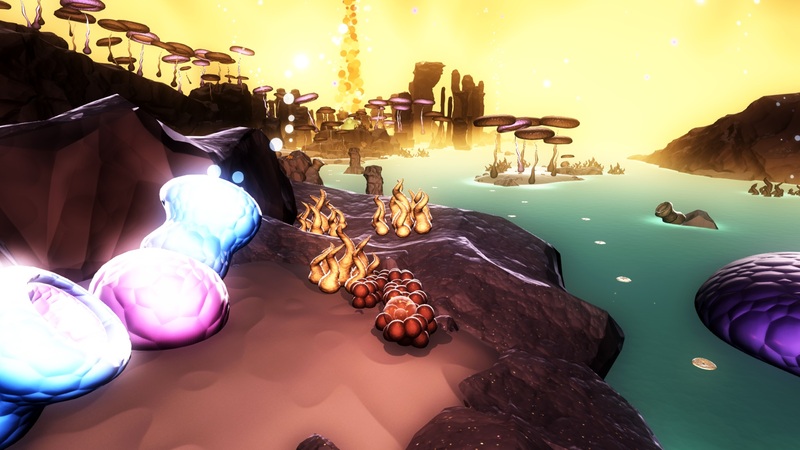 Part of enjoying Ode derives from figuring out what every plant and object does, and Ode's alien worlds do a great job of plotting the player's path from ignorance to understanding. Almost everything in the world responds to your touch in some way, and so you naturally respond to this by rolling over, into, or through everything you can. You quickly become a master of creating harmonic improvisations that stack atop the beats and rhythms produced by igniting those globular green masses, a virtuoso of interplanetary jazz. 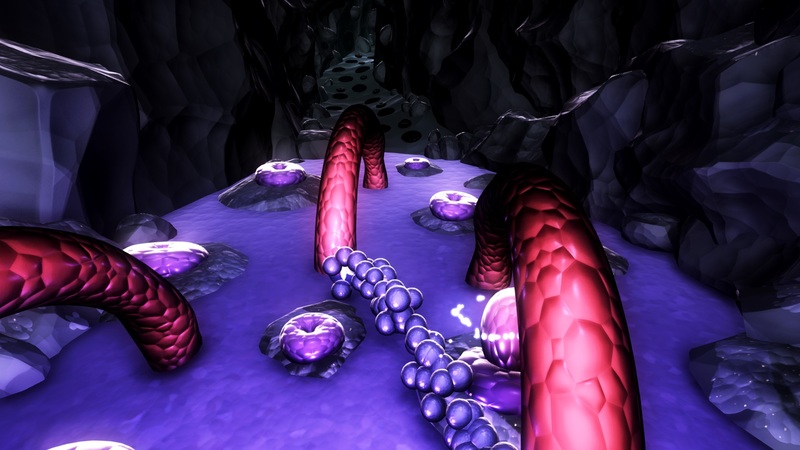 Ode is a short game, with only four levels that will probably last you a half hour each. But the modest price reflects that, while the game crams an impressive amount of diversity into that brief running time. 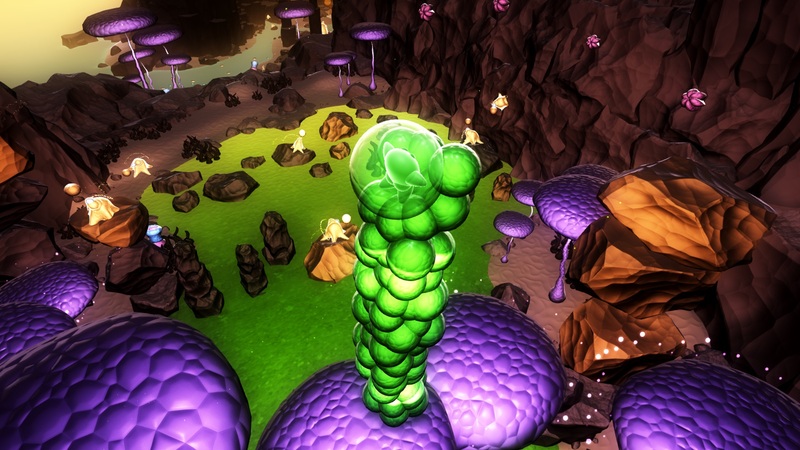 Each level is very different, taking you from a glittering underground cavern to a sun-soaked coastline lined with mushrooms that pulse out a bassy rhythm like a sub-woofer. It's also absolutely gorgeous to look at, with alluring, pastel-shaded vistas and magnificent use of particles and vegetation generation. Ode's systems evolve in some impressive ways too. In the later levels, the arrangement of tardigrades become more puzzle-like, with some hanging from walls and ceilings in a way that lightly taxes your brain for a solution. What's more, each level provides you with one or two unique abilities that alter how you move. To avoid too many spoilers, I'll only mention my favourite of these, which arranges those seeds I mentioned in a tight, linear mesh that essentially lets you walk head-over-heel like a giant, procedurally animated slinky. It's a fantastic way to navigate rough terrain, and also a supremely satisfying approach to movement in general. Not everything about Ode is perfect. 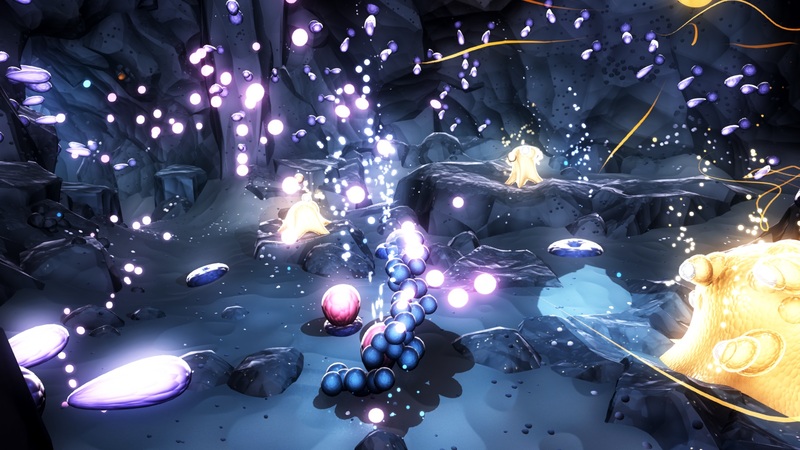 The rolling-based movement can make platforming a little cumbersome, especially in areas where there are large numbers of rocks. This is never more than a slight inconvenience, but given how important rhythm and flow is to Ode's play, it's all the more noticeable when that flow is interrupted. Also a few of the puzzles are not difficult exactly but a tad fiddly. This is particularly the case in the third level, where there are large expanses of water that, if you fall into them, cause you to drop all of your seeds and severely hampers your movement until you hit the shore. Again, it's a flow inhibitor that could have been handled a bit better. These are minor criticisms that barely register compared to the myriad ways that Ode finds to constantly reward and delight the player, all without a single mention of points or levels or unlocks or any of that baggage which weighs down so many other modern titles. There isn't even a scrap of HUD, just a sweeping, vibrant landscape that offers dozens of musical opportunities. Ode is an almost-seamless suffusion of music and play, a little game that is capable of generating a big chunk of happiness. If you doubt that, I challenge you to collect as many golden seeds as you can and take them to the end of a level. Then watch in wonder as Ode makes them bloom. For goodness sake, why aren't you playing this game right now?